Separates seeds, peel and all stringy parts from a variety of fruits and vegetables. Great for the preparation of sweet tomato sauces, ketchup, vegetable purees, pie fillings, apple sauce, fruit and berry jams, marmalades and preserves. 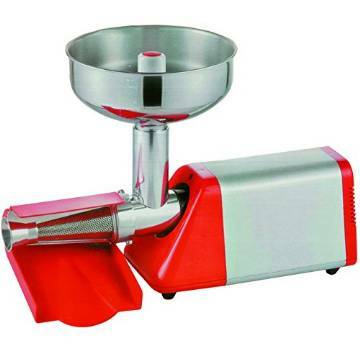 Tomato machine, suitable for home or light commercial applications. Steel main gears with a powerful 1/3 HP motors capable of milling up to 300 - 600 lbs per hour. The unit has self lubricating bushings that need no maintenance. Feed hopper and bottom tray are made of 18/10 stainless steel.